This is a continuation of some of my favorite features in the new Silverlight 5 release. Since it’s right before Christmas, I decided to do a 12 Days of Silverlight, so feel free to try and put the post to song if you would like (just make sure you YouTube it). If you haven’t downloaded the new release, you can find it on the Silverlight download page. So…. On the second day of Silverlight, the team delivered to me… a DataContextChanged event. Data binding in Silverlight is awesome. There is just no other way to describe it. That is with one exception, the lack of a DataContextChanged event. Why is this event so important? Well that is a good question and one we will look at as well as how to use the new event. Silverlight does a great job on notifying your UI (or code) when a property within an object that supports INotifyPropertyChanged is changed. That is what drives your data binding experience and allows all of the cool features to happen. But what happens if your code needs to now when the DataContext itself has changed? Maybe it needs to fire off some calculations, clean up some old code, etc. In SL4 there was no way out-of-the-box to detect this type of change. There are work-arounds out there, but the Silverlight team gave us a built-in solution in SL5. The DataContextChanged event was added to the FrameworkElement object and you can find the official documentation on the MSDN site. The event is fairly straight forward. Let’s take a look at it in action. Let’s begin with creating a new Silverlight 5 application. Before we start building our UI, let’s create a data class for this application. 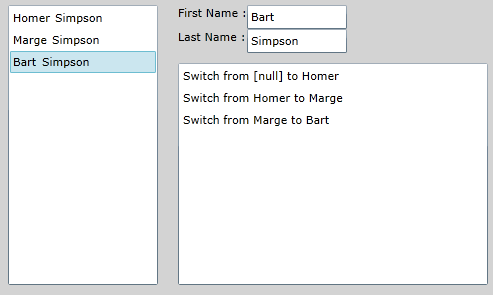 Add a new Person class to your project and add FirstName and LastName as a couple of properties. Now that we have a mechanism to visualize our log, let’s use the new DataContextChanged property to implement the logging. We are going to track when the DataContext is changed for our Customer object. 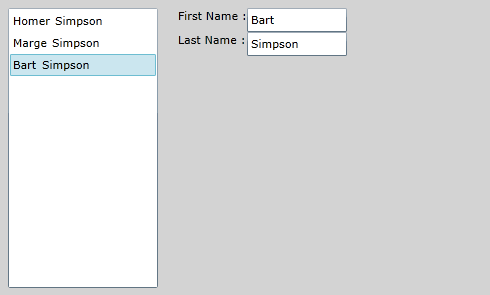 Each time the user selects a new Person out of our list we will generate a log entry. e.OldValue == null ? "[null]"
e.NewValue == null ? "[null]"
An important thing to note in the code, is that the DependencyPropertyChangedEventArgs parameter in the event has the OldValue and the NewValue of the DataContext. We take advantage of this by noting which Person we are switching from and to. This is obviously a simplistic example. However, this is an important addition and comes in handy quite often. Make sure you stop by tomorrow for the next post in the 12 Days of Silverlight series.